We're testing some new HeinOnline libraries and we want your opinion. Do you think we should subscribe to any of these libraries? Please tell us what you think by emailing us at wsll.web@wicourts.gov by April 14, 2017. Getting to the trial libraries is easy. Simply log in to HeinOnline with your library card (or on one of our computers) and look for the red TRIAL flag next to the library. HeinOnline is available to most library card holders and everyone in our three libraries. 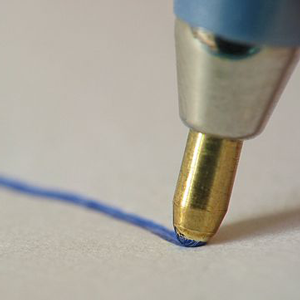 Get to it from our Articles & Journals page. With titles from the Animal Legal Defense Fund and Animal Welfare Institute, this collection aims to establish the foundational laws pertaining to animals and follow the evolution of these rights throughout the years. It includes philosophical books dating back to the 1800’s, videos, periodicals, brochures, and more. 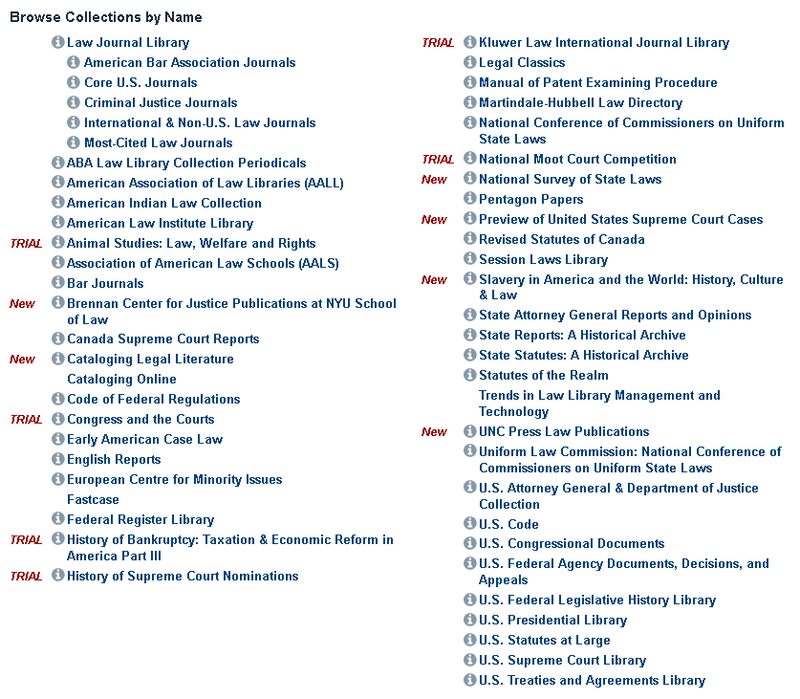 This library, featuring William H. Manz's Congress and the Courts: A Legislative History 1787-2010, brings together materials reflecting congressional concern with the composition and structure of Article III Courts and provides all relevant documents prepared by various Congresses relating to the purpose, formation, organization, and restructuring of the federal government. 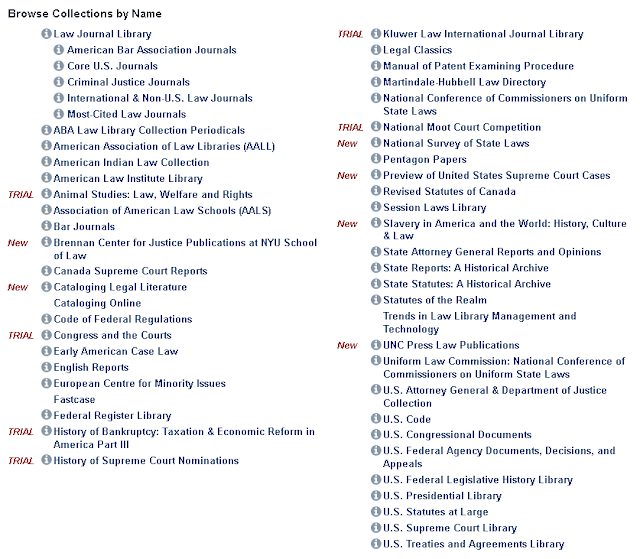 Also included are Federal Judicial Center Publications, Periodicals, Links to Scholarly Articles, CFR Title 28 – Judicial Administration, Other Related Works, and much more. Contains 23 Kluwer Law International Journals including: Air and Space Law, Arbitration International, World Trade and Arbitration Materials, International Journal of Comparative Labour Law & Industrial Relations, European Public Law, European Review of Private Law, and Legal Issues of Economic Integration. Through an arrangement with the Association of the Bar of the City of New York, this collection offers digital access to the records, briefs, and related organizational materials from the 1st to the most recent (1950-current) annual National Moot Court Competitions. We hope to improve our newsletter, WSLL @ Your Service, by creating content that best suits you, our reader. Please take a few minutes to complete this brief survey so that we may focus our efforts in the new year. The 2017 Spring primary takes place this week on Tuesday, February 21st. 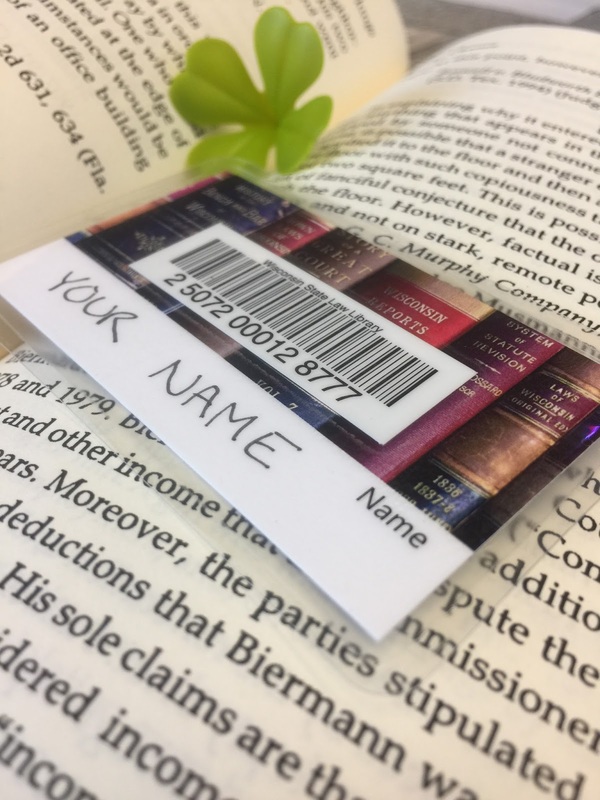 Renewing checked out books and other library materials is easy on our website. From our home page or the Search drop down menu on our site, choose the Renew / Log In option. Enter the full barcode number on the back of your Wisconsin State Law Library card to log in. Step 2: Select individual titles or click on "Renew All"
Use the "sort by due date" button to sort items on your screen. Then, check only the boxes next to the items you wish to renew and select "Renew Selected". You can also choose "Renew All" to renew everything checked out to you. Your new due date will be listed on this screen, along with the number of renewals. If you owe overdue fines or if someone has placed a hold an your item, you may not be able to renew everything. If you have a problem, just give us a call at 608-266-1600. 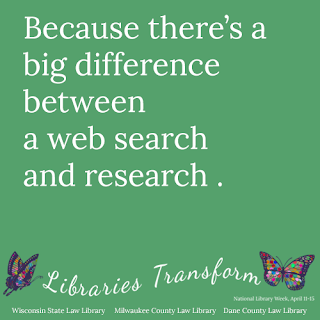 There are a lot of reasons to love your Wisconsin State Law Library card. This week we'll give you an overview of some of the resources and services you have access to when you sign up for a free State Law Library card. Check out our comprehensive, practice-oriented collection. 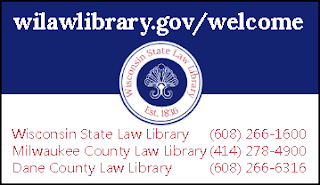 Popular books include the Wisconsin State Bar "brown books", National Business Institute seminar materials, and the Nolo and Nutshell series. And don't forget our wide general treatise collection, periodicals, and resources for other states. Books and videos can be checked out at any of our three libraries in Madison and Milwaukee. If you're located outside of one of those cities, no problem! Use our Borrow by Mail service to check out and return books through the mail. 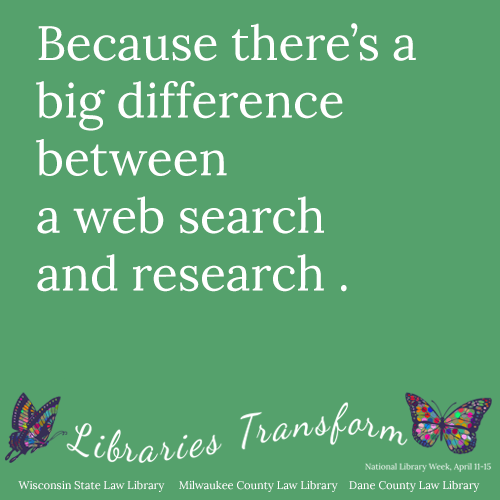 The Wisconsin State Law Library is seeking a service oriented and well organized candidate for a full-time Acquisitions Librarian. Location: Madison, WI with some statewide travel possible. Salary: Minimum salary of $52,728 (actual salary may change, commensurate with experience). Manages acquisitions by monitoring budgets, ordering materials, processing invoices, claiming materials, and staying abreast of emerging trends and best practices related to acquisitions. Develops and maintains working relationships with publishers and vendors. Assists with collection development activities; compiles and analyzes data for assessment and other statistical reports. Provides reference and research assistance to library users, including developing and teaching legal research classes for the public. Required: (1) Demonstrated experience of acquisition practices including monitoring budgets, ordering and receiving materials, maintaining order and vendor records, and invoice processing; (2) Demonstrated experience working with publishers and library vendors; (3) Knowledge of current practices and trends in acquisitions; (4) Experience creating and maintaining bibliographic and order records for a library catalog system, preferably Sierra; (5) Experience using Microsoft Office Suite including Microsoft Excel; and (6) Graduate library science coursework related to acquisitions, collection development and the provision of reference; (7) Effective oral and written communication skills. Preferred: (1) Legal reference skills, including knowledge of legal materials with ability to use legal research systems such as Lexis or Westlaw. All applications must be received by 11:59 p.m., Sunday, February 26, 2017. The Wisconsin Court System will provide reasonable accommodations to qualified applicants when requested. For additional information on the court system visit our website at www.wicourts.gov.